Kenny Dalglish - LFChistory - Stats galore for Liverpool FC! Kenny Dalglish was the first player-manager in the English game and had also to deal with Liverpool's ban in Europe. It wasn't the easiest of tasks but Dalglish was modest and somewhat prophetic: "I would be the first to realise if I wasn't good enough and then I would confront it." Dalglish was ably assisted by Paisley in his first two years. Virtually the first thing he had to do was replace the victorious fullbacks of the Paisley era, Phil Neal and Alan Kennedy with Nicol and Beglin. Kenny also decided to change the team's playing style using the Big Dane Jan Molby as a sweeper. Man Utd looked like running away with the league but Liverpool caught up with them and none other than the boss himself secured the title in the last league game of the season vs Chelsea at Stamford Bridge. 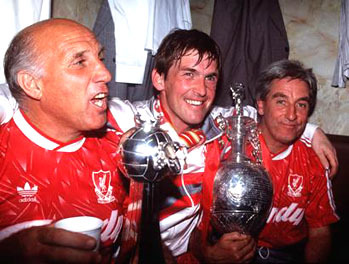 Liverpool celebrated the double by beating Everton 3-1 in the FA cup final and Dalglish had already written a new chapter in Liverpool's history. Liverpool turned out empty handed for only the third time in 15 years at the end of the following season. Golden boy Rush had gone to Italy and it was clear Dalglish had to rebuild his strikeforce. John Aldridge had signed in February and he bought John Barnes and Peter Beardsley in the summer of 1987. Liverpool didn't stumble in the league until the 20th of March. LFC had played 29 games, won 22, drawn 7, lost none and scored 65 goals and conceded 13. The title was secured with four games to go, the only disappointment when Liverpool lost unexpectedly in the FA cup final vs. Wimbledon. This wasn't Joe Fagan's team or Bob Paisley's team. This team played a more offensive football than the previous teams and was more about individual play of great players even though the team spirit was high. This was Kenny Dalglish's team. The 1988-89 season was marked by the return of Ian Rush, the Hillsborough tragedy and the crucial championship decider against Arsenal. Liverpool regained Ian Rush, lost the championship in the most dramatic of circumstances, but all paled in comparison when 96 supporters lost their lives. Football had lost its significance. Liverpool lost only 1 game out of 35 from 3rd of January to 14th of October 1989. Liverpool won the Championship race for the 18th time and Dalglish was voted Manager of the year for the third time in five years. It's fair to say that the press went over the top in their critique of Dalglish and his team in the 1990/91 season. Kenny was criticised left, right and centre. His team was getting old, his new signing, Jimmy Carter, didn't bed-in, Liverpool were too defensive and Dalglish himself was called boring, miserable and sulky. By 9 February 1991 following a 3-1 win over Everton in the League Liverpool had a three-point lead on Arsenal at the top of the table. The Reds had scored 46 goals in 24 games, 1.91 on average, hardly the performance of a team frightened to attack. Liverpool were to meet the Blues again, in the sixth round of the FA Cup. A goalless draw at Anfield forced a replay at Goodison Park. Liverpool took the lead three times, but Tony Cottee equalised one minute from normal time. In extra-time Liverpool were in front once more, but another goal from Cottee in the 113th minute meant a second replay had to take place. Dalglish told reporters: "if there has ever been any better cup-ties than that, then I wish that someone would send me a video of them. I have never been involved in a game like that before." 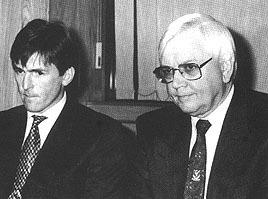 The next morning Dalglish attended a meeting that was held every month with White and Robinson. Twenty minutes in Dalglish stunned them into silence by saying: 'I want to resign.' 'Why?,' asked White finally. 'I’ve had enough. I need a break. I just feel as if my head is exploding.' 'I want to go now.' Today.' Robinson offered him a sabbatical but Kenny had made his mind up. At 4pm Liverpool held an emergency Board meeting at which they reluctantly accepted his resignation and shortly after 11am on 22 February 1991 White said to the disbelieving press: 'Thank you for coming on such short notice. I’m going to read a short statement: With great regret I have to say that Kenny Dalglish has requested to the Board of Liverpool to resign as manager.' Kenny's famous last words to the press on the 22nd of February were: "This is the first time since I came to the club that I take the interest of Kenny Dalglish over Liverpool Football Club. This is not a sudden decision. The worst I could have done was not to decide. One could argue that this decision hadn't come at a good time but there is no good time in cases like this. The main problem is the pressure I put on myself because of my strong desire to succeed. The stress that comes right before and after games has got the better of me. Some might have difficulty understanding my decision but this decision stands. I would be betraying everyone if I wouldn't let them know there is something wrong. I have been involved with football since I was 17. Twenty years with the two most successful teams in Britain, Celtic and Liverpool. I've been at the front all these years and it is time to end it." A little while later at the Lime Street train station in Liverpool the announcer read the typical announcements about the delays of the trains but added apologetically: "Kenny Dalglish has resigned as Liverpool manager, I just thought you’d like to know that." Dalglish revealed in his autobiography the reason for his resignation. "Although I didn’t realise it at the time, Hillsborough was the most important factor in my decision to leave Liverpool in 1991. In truth, I had wanted to leave Anfield in 1990, a year before I eventually resigned. In the 22 months between Hillsborough and my resignation, the strain kept growing until I finally snapped. By christmas my body was covered in big blotches. A few even appeared on my face. I saw a doctor nearly every day for injections. He used to come to the ground, bend me over, give me injection in one cheek and send me home like a pin-cushion. I would go to bed, wake up the next morning, go back to the ground and try to start again. I don’t know whether the rash resulted from the general strain. My lack of tolerance towards the children probably upset me even more than it did them. I hated to see the surprise and hurt on the faces of my children when I bawled at them. As a player, I was pretty much teetotal because I was dedicated to my profession but in the period before I resigned I used to drink wine so I could me more sociable with my family. After Hillsborough, Marina began learning about counselling and tried to counsel me. But my family could see how desperately I needed a break, I was unwell and under strain. I started having doubts about myself and my ability to make decisions. In the past I would just make the decision, usually more right than wrong and move on without thinking. Now I agonized over anything." Dalglish admitted later that he would have returned to work at Liverpool at the end of the summer. "If Liverpool had asked me to carry on as manager the moment I returned from Florida, I’d have jumped at the chance because my batteries were recharged. Sadly, they never asked. While in Orlando, I received a phone call to tell me Graeme Souness had got the job and I felt a twinge of regret." Another Liverpool legend had gone from Anfield. Kenny Dalglish admits the strain of the Hillsborough disaster caused him to quit Liverpool. Player-manager Dalglish seals the league win against Chelsea. Dalglish quit Liverpool on 21.02.1991. Match report from 05.03.1994 on Blackburn Rovers - Liverpool from The Daily Express. "Kenny Dalglish knew his players. We never even had any set pieces really. He just went out and said 'Go and beat them'. We never worked on patterns of play, which people would be amazed at now." "Kenny’s transition to manager was so smooth. He was amazing because he combined being your mate and being your boss at the same time. Not many more managers could pull that off and it was tricky sometimes because you didn’t know of he was talking to you as a mate or a boss. Having said that, he used to always have a go at me more anyway. I was his whipping boy." "Liverpool always outed at the first sign of decline. Then they'd give a new player a season or two to look at the scene before moving into the first team. I can tell you when I was a manager there, I never enjoyed such a luxury. Kenny came through Heysel and Hillsborough with some of his players. He'd become so emotionally involved with the whole Liverpool thing that he found it hard to say thanks, but no thanks. Then I came along and my job was to move all the people away. So I was the bad guy. Nobody's ever written or said that. Sure, I know I made mistakes, both in my manner and the way in which I tried to change things too quickly. But everyone accepted that that when I took the job that it was the most difficult period for the club in its recent history. We managed to win the cup in my 2 and 1/2 years, but my timing was all wrong. Players like Redknapp, McManaman and Fowler were waiting to flourish, but were still too young." "If Liverpool had waited until the summer, and then asked me to go back as manager, I would have gone back." "Liverpool practiced small-sided games every day and it was high-intensity stuff. We used to do a very light warm-up, jog around the field a couple of times to loosen the limbs, do a few stretches, put the cones down for goals and then go into five-a-side or eight -a-side. t was the same every single day. There was no tactical work, none whatsoever. All the strategic stuff was done within the small sided games. Liverpool believed that everything we faced in five-a-sides would be encountered again on match day. That was why the five-a-sides were so competitive. Liverpool’s training characterised Liverpool’s play – uncomplicated but devastatingly effective."